When the new season rolls around and the trends hit the stores there are usually some that excite us more than others. This seasons 1970’s renaissance is already TOTALLY up our street and when you add a touch of tassel and fringe into the mix we are in sartorial heaven. Fringing has been making a come back over the past few seasons with designers using a hint here and there but this season it was all over the catwalks from head to tassel-y toe. 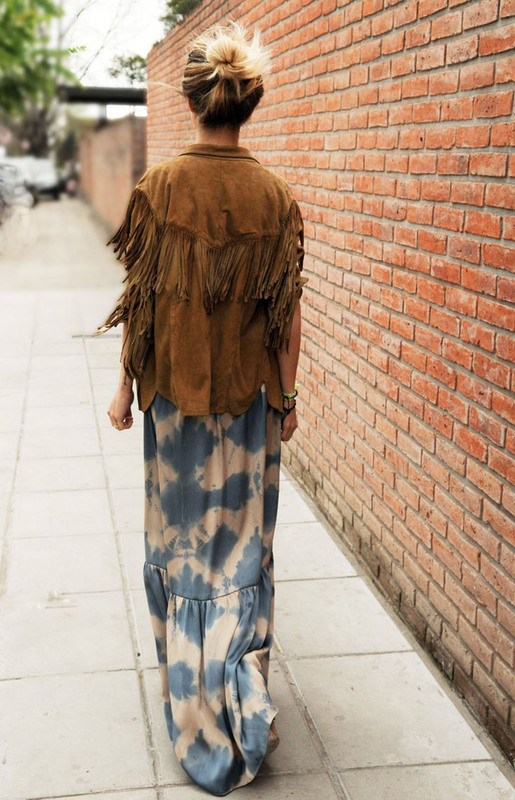 If you are a boho babe you’ll be snapping this look up easy peasy but for those who are less lovers of a retro look you maybe thinking you will look like Stevie Nicks and Barney Rubble’s love child. 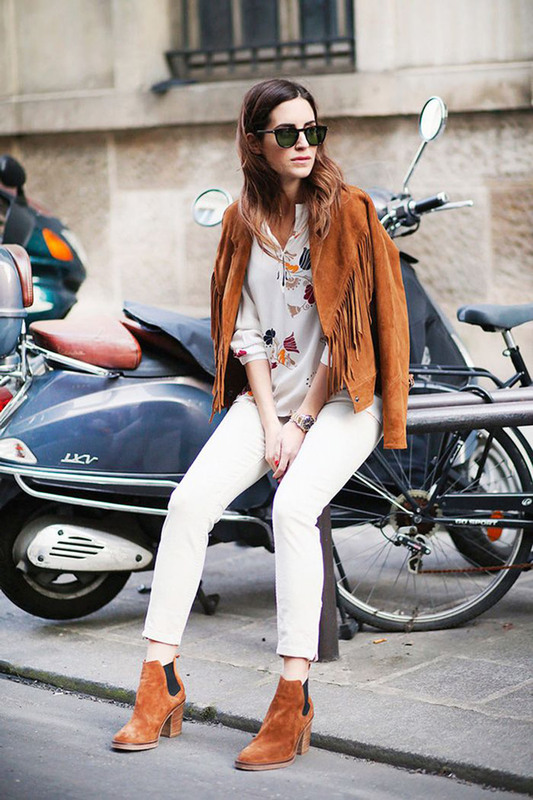 Fear not, you CAN dip your toe into the trend and pull it off in a completely modern way. We promise. Designers from Alberta Feretti, Saint Laurent, Altuzurra and Emilio Pucci amongst others all sent fringe and tassels down the catwalk and probably the easiest way to adopt this look is with a fringed jacket or gilet. All over the high street in either lux leather or soft suede this is probably one of the key pieces for SS15. Whether you want to channel your inner rock chic or throw on a hint of Western, this is the piece you need in your wardrobe. And we defy you not to have bags of fun shimmying while you are wearing it too. Go on do it. It’s the law. Alternatively add a dash of fringe with an accessory and invest in a tassel fringed bag which you can then layer with other fringed pieces as and when you wish for a more Bohemian feel. Easy to dress up and down, throw a bag on over your favourite summer frock or best loved jeans and t-shirt and you’re good to go. There is also an array of fringe covered footwear: from flats and mules for a laid back look, heeled sandals for a sexier swoosh and simple suede boots for a modern take on cowboy. Eveningwear too has adopted this look with new look tassels and fringing spliced upto the thigh in dresses and skirts, and layered and dip dyed fringe tunics for a free spirited feel. All in all this has to be one of the most fun trends of season! 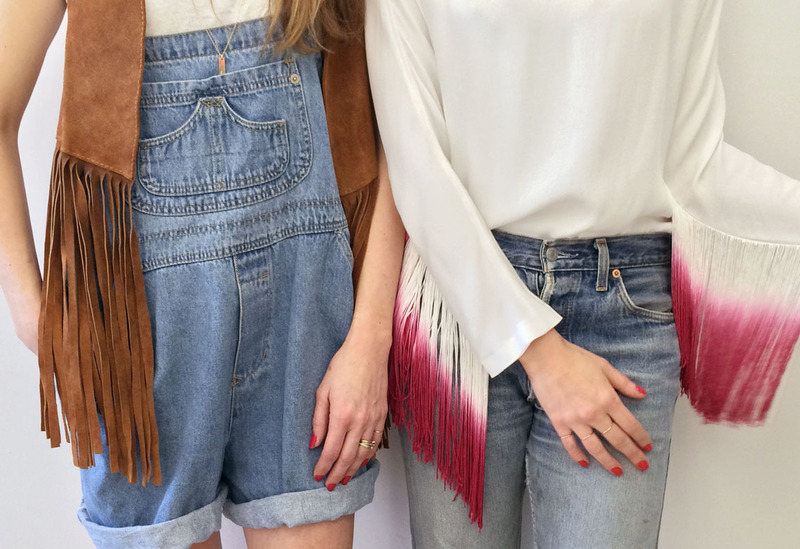 Alice & Hannah are the two fashion-loving girls behind hot British brand Belle & Bunty. Having met at the London College of Fashion, they debuted their first ready-to-wear collection in 2003, followed by their bridal collection in 2010 after their own weddings. These two ladies ooze style and will be sharing items from their coveted Belle & Bunty LOVES collection alongside the hottest fashion trends right here every month!